This thesis is about writing proficiency among students of secondary education . Due to globalization , the ability to express oneself in a language other than the first language ( L1 ) is increasingly becoming a condition for educational success . In The Netherlands , this â other â or second language ( L2 ) is usually English . Although secondary school students are already quite able to express themselves in English , their L2 essays are often of lower quality than L1 essays , in terms of language use , but also in terms of organization . 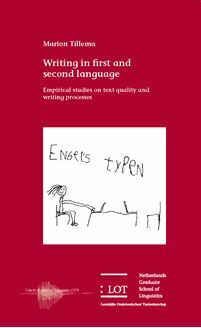 The research reported in this thesis was aimed at explaining this quality difference by comparing L1 and L2 relations between essay quality and writing processes . Analyses of writing processes involved cognitive activities such as reading the assignment , process planning , content planning , evaluating and revising . Results show that , in general , cognitive activities are relevant to essay quality at different stages of task execution during L1 and L2 writing . This means that writers need to distribute their attention differently across task execution during L1 and L2 writing . However , additional analyses show that if students â general language proficiency levels are included in the analyses , this L1 / L2 contrast disappears . For students with high general L2 proficiency , the demands of L2 writing in terms of how often cognitive activities are applied during certain stages of task execution are similar to the demands of L1 writing .